The new Renault Megane range. RENAULT'S quest to win hearts and minds appears to be succeeding. Troubled with reliability issues from its previous generation Meganes, the current model has upped its game significantly, and is set to push on further with an updated range. An attractive Megane wagon has arrived, along with GT-Line models featuring chassis tuning from the renowned Renault Sport department. Top of the pile is a new limited edition GT 220 Sport Wagon featuring the same 2.0-litre turbo engine found in the quite brilliant Megane RS 265, albeit de-tuned to 220bhp (hence GT 220) or 162kW. The new range gives Megane buyers wider scope for choice, with plenty of driver-focussed offerings in the line-up. On our lengthy routes through the Gold Coast hinterland, the Meganes showed their charm. The entry-level cabin feels roomy up front for a mid-sized car, with an appealing mix of cloth seats, soft plastics and an unfussy centre console. Move up into the GT-Line range ($5500 premium) you get cosseting cloth sports seats, leather sport steering wheel and an attractive and rather racy dash panel. Hop into the Privilege variant ($9000 premium) and there are charcoal leather seats with white piping, or grey leather upholstery borrowed from the RS 265 Trophy + if you opt for the GT-Line Premium Pack. The rear seats are decent for leg room, but adults of average height will feel head room is a tad stingy. The sloping roof line of the wagon in particular means you've got to mind your head on entry too. Dashboards and centre consoles no matter the spec level are all very well laid out, with the sat nav screen (when provided) clearly placed on top of the dash. The GT-Line range offers the best bang for your buck; its sporty features and flashes sure to appeal to the younger market Renault is pitching at. 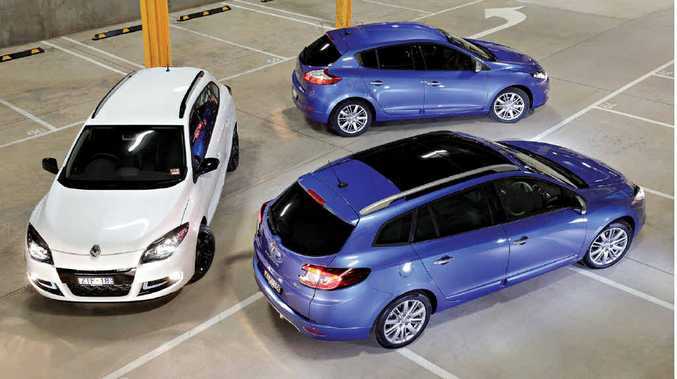 Depending on what you want from a driver's perspective, the enlarged Megane range offers something for everyone. The entry level Hatch Expression and Wagon Dynamique both come with 2.0-litre petrol engines and sensible, compliant rides for the less enthusiastic drivers. It's the GT-Line range that is a bit more red-blooded though. Featuring a lower chassis and optimised spring and damper ratings aimed at improved road holding, you sense these models have been nicely breathed on by the experts at Renault Sport. Mated to the 2.0-litre naturally aspirated petrol engine the package is successful, and it makes for a sporting, if not entirely thrilling, drive. The trade-off is a comfortable and balanced ride over bumpier road surfaces, and long distance highway cruises feel comfortable. The diesel model, while frugal, lacks power with just 81kW. Mated to Renault's CVT auto you can't exploit its torque pull to best effect either, but at 4.4 litres/100km it should still attract buyers. The winner is the limited edition GT 220 Sport Wagon with Renault Sport chassis. While not in the Megane RS 265 Trophy+ level for sheer driver enjoyment, it makes excellent sense as a performance all-rounder while not suffering the 265's crashy ride. Its 2.0-litre turbo engine offers the power the GT-Line chassis deserves, and impressively returns a better economy figure that the non-turbo 2.0-litre CVT variants. Available only as a manual, it is a rewarding steer that puts its power down through the front wheels nicely enough without too much torque-steer, and its cornering grip and balance are brilliant to truly earn the coveted RS badge. Steering throughout the range is nicely weighty and responsive, meaning tackling the twisties with gusto always brings reward. Meganes offer enough to make you feel you're getting good value through the range. Entry level cars feature Bluetooth, CD/MP3, USB and auxiliary sockets, cruise control, six airbags and electronic safety features. The GT-Line cars again look best value, adding the sportier chassis setup, sat nav with joystick control, dual-zone climate control, funkier interior features, auto lights and wipers, leather steering wheel, 17-inch alloys and hill start assist. The Premium Pack adds leather, heated seats, panoramic sunroof, parking sensors and a rear view camera. It also comes with Renault's Visio system, alerting the driver to straying out of lane and automatic operation of the high and low beam headlights. The GT 220 Sport Wagon features 18-inch black wheels, Dunlop Sport Maxx tyres, roof bar, red themed RS interior, and an R.S. Monitor. This system allows you to scroll through performance data, stopwatch and even your best 400m standing start and 0-100kmh times. The mid-size Megane works well for families with younger children, and space for adults in the back is quite cosy. Luggage space is average in the hatch, while the wagon versions offer a boot cargo volume of 524-litres; 40% bigger than the hatch, and one of the largest in its class. The wagon's rear seats fold flat, as does the front passenger seat, giving an impressive maximum load length of 2550mm and total carrying capacity of 1600-litres. The diesel is a standout winner in the fuel frugality stakes, but the petrol motors suit the Megane better, particularly the GT-Line variants. For a truly sporting engine, the GT 220 Sport Wagon returns an excellent 7.3L/100km. The Megane's facelift may not be too striking, but the wagon's introduction is a real boon .The bigger car is more successful design-wise than the hatch, and more practical inside. For those not brave enough to buy a Megane RS 265 Trophy+, or for performance drivers with kids, the RS 220 Sport Wagon is an ideal middle-ground, and well priced. With a much-needed expansion of range, the Megane is a sensible choice for those seeking a break with the norm, and now there really is something for everyone. The good stuff: GT 220 Sport Wagon gives the Megane range a practical performance hero with looks to match, competitive entry-level pricing, much greater specification choice. What we'd like to see: More powerful diesel, driver aids able to be disabled on the RS 220 Sport Wagon, the 2.0-litre turbo for the hatchback versions too. Warranty and servicing: Five-year unlimited kilometre warranty, GT 200 Wagon gets three years with unlimited kilometres. Capped price servicing is $299, annually or 15,000km (for the first three years), while the GT 200 needs its $299 service every 10,000km. Details: Five-door hatch; five door wagon; coupe-cabriolet front-wheel drive range. Engines: 2.0-litre four-cylinder petrol generating maximum power of 103kW @ 6000rpm and 195Nm @ 3750rpm; 2.0-litre four-cylinder turbo petrol 162kW @ 4750-6500rpm and 340Nm @ 2400-3500rpm; 1.5-litre four-cylinder diesel 81kW @ 4000rpm and 240Nm @ 1750rpm. Transmissions: Six-speed manual and continuously variable automatic. Consumption: 2.0-litre - 7.8 litres/100km; 2.0-litre turbo - 7.3L/100km; 1.5-litre diesel - 4.4L/100km. CO2: 2.0-litre - 181; 2.0-litre turbo - 169; 1.5-litre diesel - 115. Bottom line: Megane Hatch Expression $20,990, Hatch GT-Line $26,490, Hatch Privilege $29,990, Wagon Dynamique $26,490, Wagon GT-Line $27,990, Wagon Premium $31,490, Coupe-Cabriolet $36,990, Megane GT 220 Sport Wagon $36,990.